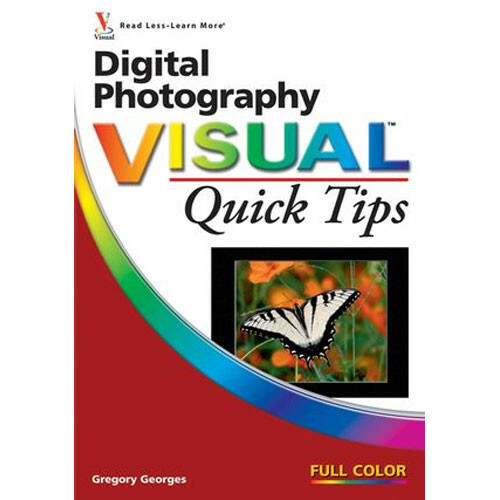 Digital Photography Visual Quick Tips - Would you like a quick, visual way to learn how to take better digital photos, edit and enhance them, make eye-popping prints, and create photo albums, slide shows, and online galleries? Then Visual Quick Tips are for you. Visual Quick Tips will increase your productivity by providing you with shortcuts, tricks, and tips to help you work smarter and faster. About the Author: Gregory Georges is the author of the best-selling first edition of Digital Photography: Top 100 Simplified Tips & Tricks, as well as 50 Fast Digital Photo Techniques, 50 Fast Photoshop 7 Techniques, and 50 Fast Digital Camera Techniques. He has been an active photographer for over 25 years and a Photoshop expert since the early releases of the product. Over his career, he has taken pictures with medium format, 35mm, and digital cameras - resulting in a collection of over 15,000 images. Georges is also a contributing writer for eDigitalPhoto Magazine, which is a new sister publication to shutterbug magazine. Additionally, he has written articles for other magazines and content for a variety of vendors and web sites to be used to promote his books. Box Dimensions (LxWxH) 7.0 x 4.9 x 0.4"